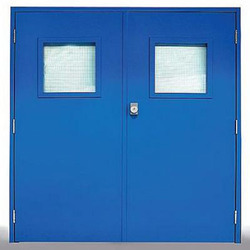 We are a leading Manufacturer of hmps door from Ahmedabad, India. DPPL HMPS DOOR SETS are available in different configurations with single leaf and double leaf frames to satisfy client’s requirements . Unmatched aesthetics combined with smooth flush construction, effective use of vision panels and unlimited ranges of paint finishes.